Firearms legislation in Switzerland allows the free purchase of semi-automatic, but not fully automatic firearms by Swiss citizens and foreigners with permanent residence. [note 1] Permits for concealed carrying in public are issued sparingly. [note 2] The acquisition of fully automatic weapons, suppressors and target lasers likewise requires special permits issued by the cantonal firearms office. Use of hollow-point and soft-point ammunition is limited to hunting. Swiss gun culture has emerged from a long tradition of shooting (tirs), which served as a formative element of national identity in the post-Napoleonic Restoration of the Confederacy, and the long-standing practice of a militia organization of the Swiss Army in which soldiers' service rifles are stored privately at their homes. In addition to this, many cantons (notably the alpine cantons of Grisons and Valais) have strong traditions of hunting, accounting for a large but unknown number of privately held hunting rifles, as only weapons acquired since 2008 are registered. Switzerland thus has a relatively high gun ownership rate. There are no official statistics, and estimates vary considerably. The 2017 report from Small Arms Survey has estimated that the number of civilian-held firearms in Switzerland is of 2.332 million, which given a population of 8.4 million corresponds to a gun ownership of around 27.6 guns per 100 residents. Other estimates place the number of privately-held firearms upwards to 3.400 million, giving the nation an estimate of 41.2 guns per 100 people. When Switzerland joined the Schengen Information System in 2008, it was forced to introduce a central registry for firearms. Only firearms which changed hands since 2008 are registered. The number of registered firearms in this database was reported as 876,000 as of August 2017. Switzerland's Weapons Law (WG, LArm) and Weapons Act (WV, OArm) has been revised to accede to the Schengen Treaty effective 12 December 2008. The Act on Personal Military Equipment (VPAA, OEPM) governs the handling of military equipment, and in particular the handling of personal weapons by military personnel. Firearms, such as pistols, revolvers, rifles, pump guns (German: Vorderschaftrepetierer), lever-action rifles, self-loading guns (shotguns and rifles). Air and CO2 guns with a muzzle energy of at least 7.5 joules, or if there is risk of confusion with a firearm. Imitation, blank firing guns (German: Schreckschuss) and air-soft guns when there is risk of confusion with a firearm. Butterfly knives, throwing knives, switchblade or automatic knives with total length greater than 12 cm and blade length greater than 5 cm. Daggers with a symmetrical blade less than 30 cm. Devices that are intended to hurt people such as batons (German: Schlagrute), throwing star, brass knuckles, slings with armrest. Electric shock devices and spray products with irritants in Annex 2 weapons ordinance (WV/OArm), except for pepper spray. The federal shooting range of Versoix, Switzerland; people come to such ranges to complete mandatory training ("Obligatorischschiessen") with service arms, or to shoot for sport and competition. Automatic firearms such as machine guns. Automatic knives when the blade more than 5 cm and total length of more than 12 cm. Butterfly knives when the blade more than 5 cm and total length of more than 12 cm. Throwing knives; regardless of the shape and size. Symmetrical daggers where blade length is less than 30 cm. Shock rods or stun guns. Buttstock-equipped slingshots (German: Schleudern mit Armstütze). Hidden firearms that imitate an object of utility, such as shooting phones. valid official identification or passport copy. criminal record copy not older than 3 months. Family name, first name, birth date, residence address and signature of the person who sells the weapon or essential weapon component. Family name, first name, birth date, residence address and signature of the person who purchases the weapon or an essential weapon component. Kind of weapon, manufacturer or producer, label, caliber, weapon number, and date and place of transfer. Type and number of the official identification of the person who acquires the weapon or the essential weapon component. This information must be sent within 30 days to the cantonal weapon registration bureau, where the weapon holders are registered (art. 9 WG/LArm). Single-shot and multi-barreled hunting rifles and replicas of single-shot muzzle loaders. Hand bolt-action rifles, which are commonly used in off-duty and sporting gunnery recognized by the military law of 3 February 1952 and shooting clubs for hunting purposes in Switzerland. Compressed air and CO2 weapons that develop a muzzle energy of at least 7.5 joules, or their appearance may be mistaken for real firearms. Ready ammunition of the Swiss Army. Soldiers equipped with the Sig 550 assault rifle used to be issued 50 rounds of ammunition in a sealed can, to be opened only upon alert and for use while en route to join their unit. This practice was stopped in 2007.
a passport or other valid official identification (the holder must be over 18 years of age and not psychiatrically disqualified nor identified as posing security problems. Further, they must not be a citizen of the following countries (art. 12 WV/OArm): Serbia, Bosnia and Herzegovina, Kosovo, Macedonia, Turkey, Sri Lanka, Algeria and Albania). 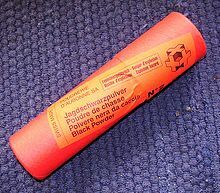 A Swiss 100 gram black powder container. Ammunition with projectile containing an explosive or incendiary device. Ammunition with one or more projectiles releasing substances which damage the health of people in the long run, particularly those mentioned in annex 2 of the WV/OArm. Ammunition, missiles and missile launchers for military explosive. Ammunition with projectiles for transmitting electric shocks. Ammunition for handguns which may cause deformations. To carry a firearm in public or outdoors (and for a militia member to carry a firearm other than his issued weapons while off-duty), a person must have a gun carrying permit (German: Waffentragbewilligung, French: permis de port d'armes, Italian: permesso di porto di armi; art. 27 WG/LArm), which in most cases is issued only to private citizens working in occupations such as security. It is, however, quite common to see a person in military service to be en route with his rifle, albeit unloaded. The issue of such exceptional permits are extremely selective (see #Conditions_for_obtaining_a_Carrying_Permit). Has a valid hunting license and is carrying the firearm for hunting. Is participating in a demonstration and is carrying the firearm in reference to a historical event. Is participating in a shooting competition for air-soft guns, provided that the competition has a secure perimeter. Is an airport security officer for an authorized country, a border patrol officer, or a game warden, who is carrying the firearm in the course of their employment. Furthermore, any licensed holder of a gun may transport an unloaded firearm for special situations (see #Transporting guns). fulfilling the conditions for a buying permit (see section above). stating plausibly the need to carry firearms to protect oneself, other people, or real property from a specified danger. passing an examination proving both weapon handling skills and knowledge regarding lawful use of the weapon. The carrying permit remains valid for a term of five years (unless otherwise surrendered or revoked), and applies only to the type of firearm for which the permit was issued. Additional constraints may be invoked to modify any specific permit. (art. 27 § 3 WG/LArm). The gun must be unloaded and transported separately from any ammunition, with no ammunition being transported in a magazine. To or from courses or exercises in marksmanship, hunting or for military purposes. To or from an army warehouse. To show the gun to a possible buyer. To or from a holder of a valid arms trade permit. To or from a specific event, e.g. gun shows. A 2017 amendment to the EU Firearms Directive, known as the "EU Gun Ban", introduces new restrictions on firearms possession and acquisition, especially on semi-automatic firearms, personal defense weapons, magazine capacity, blank firing guns and historical firearms. The restrictions must be introduced into the Swiss legal system by August 2018 due to its membership of the Schengen area. The Directive also includes an exemption covering a specific Swiss issue – it allows possession to a target shooter of one firearm used during the mandatory military period after leaving the army, provided it was converted to semi-automatic only (art. 6(6) of the Amendment Directive). This part of the Directive specifically was however challenged by the Czech Republic before the European Court of Justice due to its discriminatory nature. The Czech Republic seeks nullification of the "Swiss exemption" as well as of other parts of the Directive. Civil rights organizations plan to hold a referendum to reject the recent EU directive. According to Swiss People's Party vice-president Christoph Blocher, Switzerland should consider abandoning EU's borderless Schengen Area if the Swiss people reject the proposed measures in a referendum. The Swiss army has long been a militia trained and structured to rapidly respond against foreign aggression. Swiss males grow up expecting to undergo basic military training, usually at age 20 in the recruit school, the basic-training camp, after which Swiss men remain part of the "militia" in reserve capacity until age 30 (age 34 for officers). Prior to 2007, members of the Swiss Militia were supplied with 50 rounds of ammunition for their military weapon in a sealed ammo box that was regularly audited by the government. This was so that, in the case of an emergency, the militia could respond quickly. 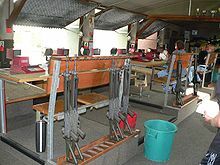 The federal shooting range of Versoix, Switzerland; people come to such ranges to complete mandatory training (Obligatorischeschiessen) with service arms, or to shoot for sport and competition. In December 2007, the Swiss Federal Council decided that the distribution of ammunition to soldiers would stop and that previously issued ammo would be returned. By March 2011, more than 99% of the ammo has been received. Only 2,000 specialist militia members (who protect airports and other sites of particular sensitivity) are permitted to keep their military-issued ammunition at home. The rest of the militia get their ammunition from their military armory in the event of an emergency. When their period of service has ended, militia men have the choice of keeping their personal weapon and other selected items of their equipment. However, keeping the weapon after end of service requires a weapon acquisition permit (art. 11-15 VPAA/OEPM). The government sponsors training with rifles and shooting in competitions for interested adolescents, both male and female. The sale of military-issued ammunition – including Gw Pat.90 rounds for army-issued assault rifles – is subsidized by the Swiss government and made available at the many Federal Council licensed shooting ranges. That ammunition sold at ranges must be immediately used there under supervision (art. 16 WG/LArm). The Swiss Army maintains tightened adherence to high standards of lawful military conduct. In 2005, for example, when the Swiss prosecuted recruits who had reenacted the torture scenes of Abu Ghraib, one of the charges was improper use of service weapons. Recreational shooting is widespread in Switzerland. Practice with guns is a popular form of recreation, and is encouraged by the government, particularly for the members of the militia. Prior to the turn of the century, about 200,000 people used to attend the annual Eidgenössisches Feldschiessen, which is the largest rifle shooting competition in the world. In 2012 they counted 130,000 participants. For the 2015 Federal Shooting (Eidg. Schützenfest) 37,000 shooters are registered. In addition, there are several private shooting ranges which rent guns. Switzerland has a strong gun culture compared to other countries in the world. Groups like ProTell lobby for the preservation of Switzerland's gun rights. Additionally, the Schweizerischer Schützenverein, a Swiss shooting association, organizes the Eidgenössische Schützenfeste, every five years and the Eidgenössisches Feldschiessen is held annually. Every person with a swiss citizenship, aged 10 years or older, can take part at any federal ranges and will be able to shoot for free with the ordinance rifle. Another possibility for the kids to shoot is the Young Shooters: the SAT (lit. shooting and off-duty activities) oversees lessons in which Swiss children can learn how to shoot using the SIG SG 550 starting at 15 years old for the regular course. This activity is free and the Young Shooters are able to take home the rifle in-between the lessons if they are 17. For security reasons however, the breech has to stay at the range in which they attend the lesson. This training takes place over a span of 6 years within a 3-4 month period each year and, if wanted, they can become instructors for the new generation of Young Shooters. Traditionally liberal Swiss gun legislation has, however, been somewhat tightened in 2008, when Switzerland has complied with European Firearms Directive. Throughout the modern political history of Switzerland, there have been advocates for tighter gun control. The most recent suggestion for tighter gun control was rejected in a popular referendum in February 2011. The vast majority of firearm-related deaths in Switzerland are suicides. The suicide method of shooting oneself with a firearm accounted for 21.5% of suicides in Switzerland in the period of 2001–2012 (with significant gender imbalance: 29.7% of male suicides vs. 3.0% of female suicides). By contrast, gun crime is comparatively limited. In 2016, there were 187 attempted and 45 completed homicides, for a homicide rate of 0.50 per 100,000 population. Of the recorded homicides (attempted or completed), 20.3% were committed with a gun (47 cases, compared to an average of 41 cases in the period of 2009–2015). In addition, there were 7 cases of bodily harm and 233 cases of robbery committed with firearms. There were 16 completed homicides with a firearm in 2016. Of these, 14 were committed with a handgun, one with a long gun and one case marked "other/unspecified". None of the involved weapons were ordinance weapons issued by the Swiss Armed Forces. Similarly, out of 31 attempted homicides with firearms, 25 were committed with handguns, two with long guns and four "other/unspecified", with no use of ordinance weapons on record. For the period of 2009–2016, on average 16.5 out of 49.4 completed homicides were committed with a firearm, 13.8 with handguns, 1.9 with long guns and 0.9 "other/unspecified"; an average 0.75 cases per year (6 cases in eight years) involved ordinance weapons. ^ a b The law of 1997 (SR 514.54) made explicit provision for the Federal Council to restrict gun ownership by nationality (art. 7 WG/LArm). SR 514.541 art. 12, passed in 2008, amended in 2014, explicitly prohibits the purchase or ownership of weapons to nationals of eight states: Serbia, Bosnia and Herzegovina, Kosovo, Macedonia, Turkey, Sri Lanka, Algeria and Albania. ^ SR 514.54 art. 27 § 4. No carry permit is necessary for hunting rifles carried by registered hunters with a hunting licence in the context of hunting or game-keeping, and historical firearms carried in the context of re-enactment or memorial events. Justifiable transport of unloaded firearms is regulated in art. 28. 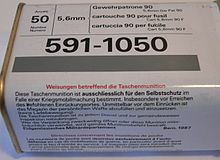 ^ a b c d "SR 514.541 Verordnung über Waffen, Waffenzubehör und Munition (Waffenverordnung WV)" (official site) (in German, Italian, and French). Berne, Switzerland: The Swiss Federal Council. 1 July 2016. Retrieved 10 June 2017. ^ a b c d e f g "SR 514.54 Bundesgesetz über Waffen, Waffenzubehör und Munition (Waffengesetz WG)" (official site) (in German, Italian, and French). Berne, Switzerland: The Swiss Federal Council. 1 July 2016. Retrieved 10 June 2015. ^ "Banned weapons, ammunition and weapon components" (official site) (in German, Italian, French, and English). Berne, Switzerland: Federal Office of Police, fedpol. 15 May 2018. Retrieved 2 June 2018. ^ Julie Hartley-Moore, "The Song of Gryon: Political Ritual, Local Identity, and the Consolidation of Nationalism in Multiethnic Switzerland", Journal of American Folklore 120.476 (2007) 204–229, citing Kohn Hans Kohn, Nationalism and Liberty: The Swiss Example. London: George Allen and Unwin, 1956, p. 78. ^ "Global Firearms Holdings Dynamic Map". smallarmssurvey.org. Geneva, Switzerland: Institut de hautes études internationales et du développement. June 2018. Retrieved 9 July 2018. ^ "Infographics on Global Firearms Holdings" (PDF). smallarmssurvey.org. Geneva, Switzerland: Institut de hautes études internationales et du développement. June 2018. Retrieved 9 July 2018. ^ Erich Aschwanden, In der Schweiz gibt es mehr Pistolen und Gewehre als geschätzt, NZZ, 17 August 2017. ^ a b "SR 514.10 Verordnung über die persönliche Ausrüstung der Armeeangehörigen (VPAA)" (in German, French, and Italian). The Swiss Federal Council. 5 December 2003. Retrieved 19 January 2014. ^ "Soldiers can keep guns at home but not ammo". SWI Swissinfo.ch, a branch of the Swiss Broadcasting Corporation (SBC). 27 September 2007. Retrieved 16 March 2015. ^ "Finland seeks exception from EU gun ban". Reuters. Retrieved 9 March 2017. ^ "EU Gun Ban : Intervention Suisse à Bruxelles". ASEAA. Retrieved 9 March 2017. ^ "Trilog schließt die Verhandlungen zum "EU-Gun ban"". Firearms United. Retrieved 9 March 2017. ^ "Gun lobby stirs to life in Europe". Politico. Retrieved 9 March 2017. ^ "Position of the European Parliament adopted at first reading on 14 March 2017 with a view to the adoption of Directive (EU) 2017/... of the European Parliament and of the Council amending Council Directive 91/477/EEC on control of the acquisition and possession of weapons" (Parliamentary decision). Strasbourg: European Parliament. 14 March 2017. P8_TC1-COD(2015)0269. Retrieved 24 April 2017. ^ "Czechs take legal action over EU rules on gun control". Ministry of Interior of the Czech Republic. Retrieved 30 September 2017. ^ "Swiss tell EU: Hands off veterans' assault rifles". Reuters. Retrieved 12 March 2017. ^ "SR 514.101 Verordnung des VBS über die persönliche Ausrüstung der Armeeangehörigen (VPAA-VBS) vom 9. Dezember 2003 (Stand am 1. Januar 2015): art. 7 Taschenmunition Ziff 1" (official site) (in German, French, and Italian). Berne, Switzerland: The Swiss Federal Council. 21 December 2007. Retrieved 6 December 2016. ^ "Taschenmunition fast vollständig eingezogen". Neue Zürcher Zeitung (in German). Zurich, Switzerland. 2 May 2011. Retrieved 16 March 2015. ^ Patrick Marbach (15 August 2005). "Schweizer Rekruten spielen Irak-Folterer". 20 Minuten (in German). Zurich, Switzerland. Retrieved 16 March 2015. ^ "Feldschiessen". Lebendige Traditionen. Retrieved 6 July 2015. ^ Giannis Mavris (4 July 2015). "Familienausflug mit dem Sturmgewehr". Neuste Zürcher Zeitung (NZZ) (in German). Zurich, Switzerland. Retrieved 6 July 2015. ^ Bachmann, Helena (20 December 2012). "The Swiss Difference: A Gun Culture That Works". TIME. Retrieved 19 March 2016. ^ Nelson, Soraya Sarhaddi (19 March 2013). "What's Worked, And What Hasn't, In Gun-Loving Switzerland". NPR. Retrieved 19 March 2016. ^ "Reglement über das Eidgenössische Feldschiessen" (PDF). SCHWEIZER SCHIESSSPORTVERBAND SSV. 2016. Retrieved 3 June 2016. ^ "SR 512.31 Verordnung über das Schiesswesen ausser Dienst (Schiessverordnung)" (official site) (in German, French, and Italian). Berne, Switzerland: The Swiss Federal Council. 1 January 2018. Retrieved 4 June 2018. ^ "SR 514.541 Verordnung über Waffen, Waffenzubehör und Munition (Waffenverordnung, WV)" (official site) (in German, French, and Italian). Berne, Switzerland: The Swiss Federal Council. 1 July 2016. Retrieved 4 June 2018. ^ "De-Quilling the Porcupine: Swiss Mull Tighter Gun Laws". Der Spiegel. Hamburg, Germany. 2 May 2007. Retrieved 12 January 2011. ^ "Switzerland rejects tighter gun controls". BBC News. 13 February 2011. Retrieved 26 August 2015. . "Abstimmungen – Indikatoren: Eidgenössische Volksabstimmung vom 13. Februar 2011 – Volksinitiative «Für den Schutz vor Waffengewalt»" (official site). Neuchâtel, Switzerland: Swiss Federal Statistical Office (FSO). 13 February 2011. Retrieved 26 August 2015. ^ "Polizeiliche Kriminalstatistik (PKS) – Jahresbericht 2016" (PDF) (official federal site) (in French, German, and Italian). Neuchâtel, Switzerland: Swiss Federal Statistical Office (SFO). 23 March 2015. pp. 13, 36–38. ISBN 978-3-303-19065-4. Retrieved 10 June 2017. ^ Tötungsdelikt: Aufklärung und Vorjahresvergleich (vollendet und versucht) nach Tatmittel, Beschuldigte und Geschädigte 2016 27 March 2017. Ordonnance fédérale sur les armes, les accessoires d’armes et les munitions Swiss federal application law on weapons, weapon accessories and ammunition. This page was last edited on 20 April 2019, at 13:12 (UTC).